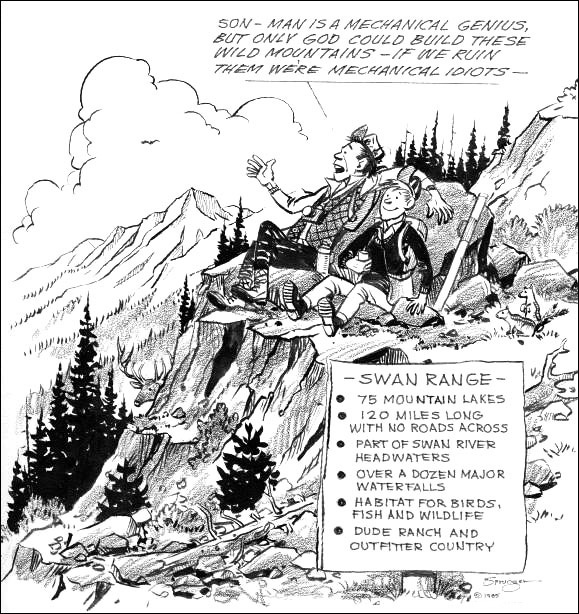 In 1988, the US Congress and the Senate voted to forever conserve 80,000 acres of the Swan Range high country for hiking, hunting, horseback riding and other quiet forms of recreation by declaring it wilderness. That bill was never signed to law, but provided clear direction about how the people want this range managed. Yet in its proposed plan, the Forest Service recommends zero acres of wilderness in the northern Swan. Treasured places like greater Jewel Basin and Bunker Creek would no longer managed foremost for their natural values. Likewise, commercial, competitive extreme sports events should not be allowed because they are not allowed in wilderness and will hamstring the wilderness potential of the Swan Crest. Hunters know the Swan Range and the South Fork produces trophy mule deer and mature bull elk and mountain goat. Anglers know the alpine lakes of the Swan are loaded with cutthroat trout and the South Fork of the Flathead River is one of the few places in the West where anglers may legally pursue bull trout. Plus the Swan is prime habitat for rare creatures like grizzly bears and wolverines. That’s why local experts at the Montana Department of Fish, Wildlife and Parks have long called for protecting the prime habitat and clean water of the Swan Range. Yet the proposed Forest Service plan calls for reduced protection for wildlife habitat. Most of us hike, walk our dogs, ride horses, or lead llamas in the Swan. We enjoy the natural sounds and smells, as well as the Swan’s spectacular scenery. Fewer than one in ten national forest users rides an expensive dirt bike or all-terrain vehicle. Besides shattering the quiet of the woods, machines like dirt bikes also trench trails and damage fragile alpine meadows. Now, the Flathead National Forest is turning its back on 40 years of management direction by increasing its emphasis on motorized recreation in the Swan. The Forest Service should listen to the quiet majority, not just the noisy minority. Jewel Basin. Strawberry Lake. Columbia Mountain. Sixmile Peak. Ready access to the peace, quiet and solitude of these places enhance our economy and quality of life. If not managed properly, the noise and smells of motorbikes and four-wheelers will drown out the peace and quiet of the mountains, damage our trails, and leave us all the poorer for it.